While Grand Theft Auto IV is racking up sales records, console makers are vying for bragging rights of their own, and Microsoft seems to be the victor. GTA IV was released April 29 and global sales totaled more than $500 million in the first week alone. The first day the latest addition to the hit Rockstar Games series hit retail store shelves, sales were $310 million. More than six million copies have been sold. The only question is, which console is the game being played on? 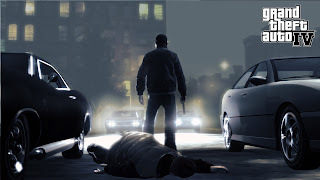 GTA IV was developed by Rockstar North on two platforms -- the Sony PlayStation 3 and Microsoft's Xbox 360. Both manufacturers are reporting higher console sales as a result. According to news reports that claim to have the inside scoop on Microsoft's sales data, Redmond is the big winner. Reportedly Xbox 360 console sales jumped 54 percent. Other reports estimate more than 60 percent of GTA IV games went to Xboxers, leaving less than 40 percent for PlayStation 3 gamers.